SDI, Inc. (SDI) releases a one-of-a-kind tool to evaluate Best in Class status for Maintenance, Repair and Operating (MRO) storerooms in support of production. After 6 months of research and consultation with industry experts, SDI is providing a comprehensive evaluation tool that provides a numerical rating of a company’s storeroom. SDI, Inc. (SDI) releases a one-of-a-kind tool to evaluate Best in Class status for Maintenance, Repair and Operating (MRO) storerooms in support of production. After 6 months of research and consulting with industry experts, SDI is providing a comprehensive evaluation tool that provides a numerical rating of a company’s storeroom. 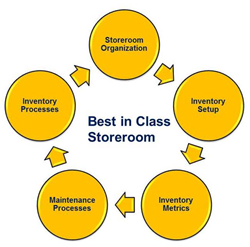 Benchmarking time for MRO storerooms is often complex, time consuming, and expensive. With extensive research over the last 6 months, covering 59 touch points across 5 areas of a storeroom, the new evaluation tool from SDI is easy to use and guaranteed to help companies achieve Best in Class status. For more information about SDI please visit: http://www.SDI.com. Established in 1971 in Philadelphia, SDI is the recognized leader in MRO supply chain services in North America with programs at over 1200 facilities. SDI is a pure integrator, driven by a relentless focus on finding the best solution for our clients and our commitment to our partners is still the cornerstone of our business. SDI exists to help you optimize performance and meet goals by providing the hands-on expertise, technology and solutions that meet the demands of your business across your entire enterprise. For more information about SDI please visit: http://www.SDI.com.